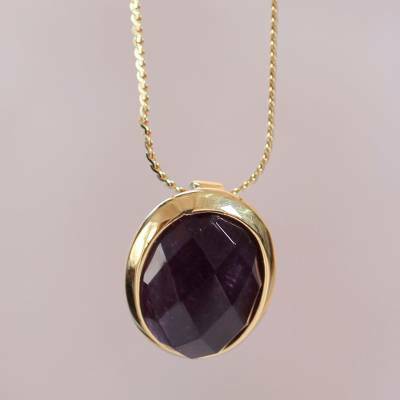 Handcrafted Faceted Amethyst and Gold Vermeil Necklace, "Aurora Glow"
Faceted amethyst radiates a violet glow, the lovely gem displayed in gold vermeil settings. By Peru's Marianela Vargas, this necklace is crafted by hand to showcase the 7-carat stone. Marianela Vargas has received 2 microcredit loans with 0% interest from Kiva and Novica, the first for $800 and the most recent for $1200. "I'd describe my work as expressive. I enjoy extroverted designs. It's a wonderful form of self expression and time just flies when I'm working." "I was born in Lima on November 2, 1969," says jeweler Marianela Vargas Balarezo. "I learned my art through private classes and workshops, but from the time I was a child I loved jewelry. I always felt a special need to make my own pieces. I went through a period when my health was a problem and, while I recovered, I looked for something to pass the time. It seemed like a good idea to do something I liked while learning something new. One day when I was out for a walk, I noticed a place that offered classes in jewelry making. I never even thought about it. I signed up and I was hooked. That was in 2003 and today I am still creating new designs filled with life. "I'd describe my work as expressive. I enjoy extroverted designs. It's a wonderful form of self expression and time just flies when I'm working. I like to use a variety of silver crafting techniques that show how beautiful it is. "I love creating, combining and producing beautiful things. I couldn't stop now if I tried. My health was my greatest challenge but it led me into this world of art. "I hope Novica shoppers appreciate my art and the dedication that goes into each piece. I hope our Peruvian art is noticed in every corner of the world." I received my Quechua Mystique quartz ring and I am so glad I ordered it. I have wanted it for a long time and decided to buy it. It is a huge stone and no one believes it a real quartz because it is so clear, but I know there are totally clear quartz crystals. The ring stands high on my finger and I like the way it is made and cut. It looks like rings that were worn during the middle ages and Renaissance in paintings of people of that time. Marianela, I love my ring and you did a wonderful job. Make more quartz jewelry! Dear Marianela, just letting you know how much I enjoy wearing my Lapis necklace! It's such a great piece, it goes with both my office clothes and jeans. I love it! To date, NOVICA has sent $91,030,916 to artisans!